Join the discussion on our forums! 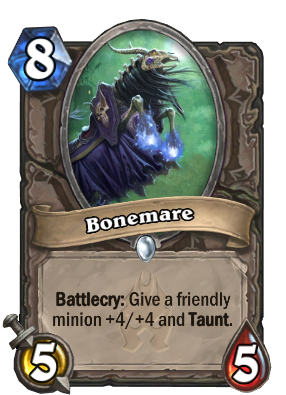 Come discuss Bonemare over in our dedicated Bonemare discussion topic. How has this not been updated yet? Still says 7 mana. Nerf to Free From Amber kappa. Glad I kept all my copies, anticipating a nerf. Over 10x 40 gold incoming! No, I think you're confusing with the free dust for "Hall of Faming". Extra copies of nerfed normal cards usually give you full dust for every copy (it did in this case!). First Dreadsteed, now this. What does Hearthstone have against horses? At least this one deserved it. Shame on the +1 mana nerf.. I wanted the battlecry to be: Give a friendly minion +0/+5 and taunt for a bit more control oriented and different numbers instead of 4/4, 5/5 etc etc. Oh this comment did not age well. This card is completely broken! Soooo many matches are decided nowadays by has Bonemare plus a good target on curve. When you compare it to Blessing of Kings you get an additional 5/5 minion plus taunt for 3 mana. That is just too powerfull. This card captures the essence of KFT. Even lich King failed to be meta-defining where this card succeeded. Maybe change the "give the minion +4/+4 to +0/+5 and taunt for just the protection? Make it a deathknight card that drops from lich king or arfus, dont touch the stats.